Sorry I'm a little late posting this photo of Tess and Jazz with their Easter goodies. It was a hectic day yesterday. Not only did the Easter Bunny leave a basket of goodies for each girl, but they also got a bag of treats and a toy from Aunt Mariann, Uncle Jim, and Sammie! Needless to say, there won't be a shortage of doggie treats in this household any time soon! Jazz and I took a quick bike ride in between the raindrops yesterday in preparation for the Road Trial this week, but, unfortunately, the weather isn't predicted to be very nice for our ride. I'm asking each of my blog friends to say a little prayer for Jazz's safety as we embark on our first-ever Dalmatian Road Trial this Thursday. Nearly a year of training and conditioning has gone into this, and I'm very excited to go on this ride. Jazz and I have made many new friends who have helped us prepare for the Road Trial, and I have just loved being around and riding horses again, especially when I can combine it with time spent with my dog. 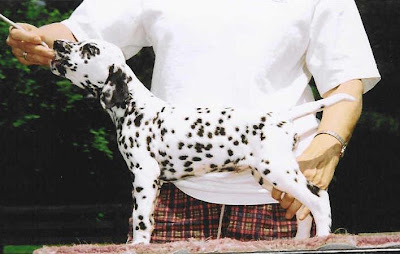 It is so awesome to see Dalmatians do what they were bred to do! Hope everyone enjoyed a wonderful Easter holiday! Jazz has been training hard in the Cozy Inn swimming pool. She has come such a long way! In January when we first took her, she had to be carried in the pool and the tech held her while she "swam" (see In the Swim post for video). Later, they taught her to use the steps to get in the pool, then swim to the other set of steps to get out. After that, she started doing that circuit on her own. Now, drumroll, please....Jazz is getting in the pool and swimming on her own with no life vest!! She now glides into the pool and swims like a duck with her feet paddling under the water, instead of the wild, frothing kicking she started out with. Most importantly, you'll notice that her tail is always wagging. She loves Michele, the technician who has been swimming her, and she is happy the whole time she's in there with her, although she always glances at me through the window when she gets out of the pool! We're all so proud of Jazz for her swimming accomplishments. It's been fabulous exercise and has improved her confidence a ton. Even though this started out as conditioning for the Road Trial, we're going to continue swimming Jazz and also Tess when we return. Jazz and her brother Peet made a therapy visit to the assisted living facility yesterday. We were filling in for our breeder and her dog Gage, so the spotted kids had big paws to fill! The residents there just adore Gage. Jazz and Peet's litter visited this facility when they were wee pups, so the folks there are always happy to see them, although they will forever be "the puppies." We started out by showing everyone how Jazz has learned to retrieve and hold her dumbbell. All of our dumbbell work came in handy when Jazz decided to become an Easter Bunny in training! We simply transitioned from holding the dumbbell to holding an Easter basket. We started with an empty basket and progressed to holding a basket filled with Easter eggs. The residents just loved Peet and Jazz in their bunny ears! One resident commented that if you live long enough, you see everything, and she was glad she had lived long enough to see THIS! It isn't every day you see a couple of spotted Easter bunnies!! Being Easter bunnies is tough work, and Peet and Jazz ended their visit with a little nap after bringing smiles to the residents and staff. We were so proud of both dogs for being well behaved and spreading some Easter cheer. So a series of circumstances fell into place and Tess came to live with us (see "Tagged" post to read how that happened). Tess introduced us to agility and the many friends we've made in the sport. She's a wonderful dog to live with and is as happy and silly as a Dal can be. Below is a photo from the day Tess came home with us. She immediately made herself at home and decided that we weren't having enough fun, so she should liven things up a bit! The Dachshund in the photo is Tiny. He was my Mom's dog and came to live with us after she passed away in 2000. Tiny was nearly 16 years old at this point and he was a good sport about tolerating Tess' antics. He was Tess' companion and buddy until he went to join Dottie and Tigger at the Rainbow Bridge when Tess was about six months old. Happy Birthday to our beautiful Tess, Starwood's Touched by an Angel! 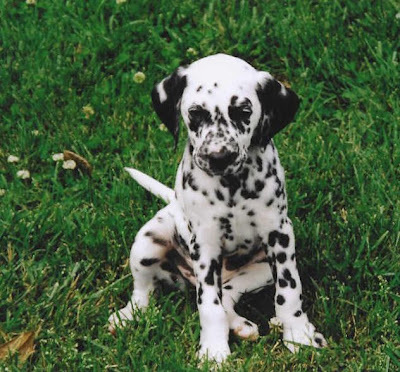 I hope she continues to spread her spotted joy for many years to come. Love ya, Tessie! !